So declares David Nairn, Artistic Director of Theatre Orangeville, whose personal mantra seems always to be to bring as many people as possible to the theatre and, sometimes where it’s harder or less possible, to bring the theatre to the people. Part of this ambition has been recognized and not for the first time, with their introduction of Theatre for Young Audiences (TYA), a program aimed at taking live theatrical productions into elementary schools. Some of those productions were “issue-based,” dealing with such problems as bullying, pre-teen alcohol use, problems at home with parents fighting, and so forth. “It is really helpful to the kids to see their own stories being acted out. The teachers still want us to do them again for the next generation of kids because the problems didn’t go away,” he added. 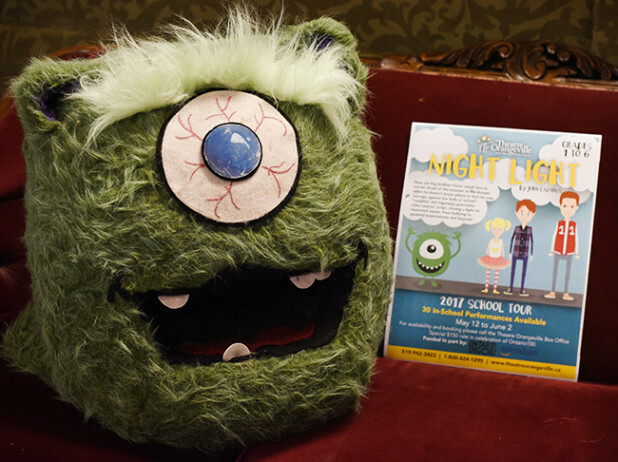 Theatre Orangeville has brought in other theatre groups, as well, that exist to travel with their productions to schools and theatres to which school groups can be bussed. The Red Barn is popular for its French productions. Through an Ontario 150 one-time grant, there is funding to begin again with Theatre for Young Audiences, small and lasting only five weeks: two for rehearsals and three for touring. There are impressive plans for the long haul of extending their running numbers of schools asking for this, from 30 schools (projected for this year) to eventually 100, covering a wide area over two sessions – one each during spring and autumn. Between talking with David Nairn and Sharyn Ayliffe, the theatre’s Programs Manager, through which she can concentrate on bringing the theatre into the lives of young people, we were given a fairly comprehensive idea of how this program will work in both the short and long term. This first year’s play is Night Light by John Lazarus, a story about bullying, in keeping with the “issues” theme that will run throughout all the plays through the years. There is just the single play per session, but it is the one that travels through the whole area for one performance per school. The actors for this program come from post-secondary educational institutions Ryerson, Humber and Randolph, and thus are offered a wonderful opportunity for young actors to participate in doing the tour with a play. This year, directing Night Light is Cadence Allen, who directed The Lion, the Witch and The Wardrobe with Young Company last year. School budgets account for such productions to be brought in. For this year, based on the one-time funding for Ontario’s sesquicentennial celebration and the support of Meridian Credit Union, the price for Night Light is low. However, the program will have to pay its own way by the school bookings and charges in the future. Night Light is a play running about 70 minutes and is followed by a Q and A, as are all productions for students. It is basically about an older brother, younger sister and his efforts to quell her fears about monsters in the night and the bully in the school yard. For information about the program, get in touch with the theatre at the Box Office 519-942-3423 or email Ms Ayliffe at sayliffe@theatreorangeville.ca.